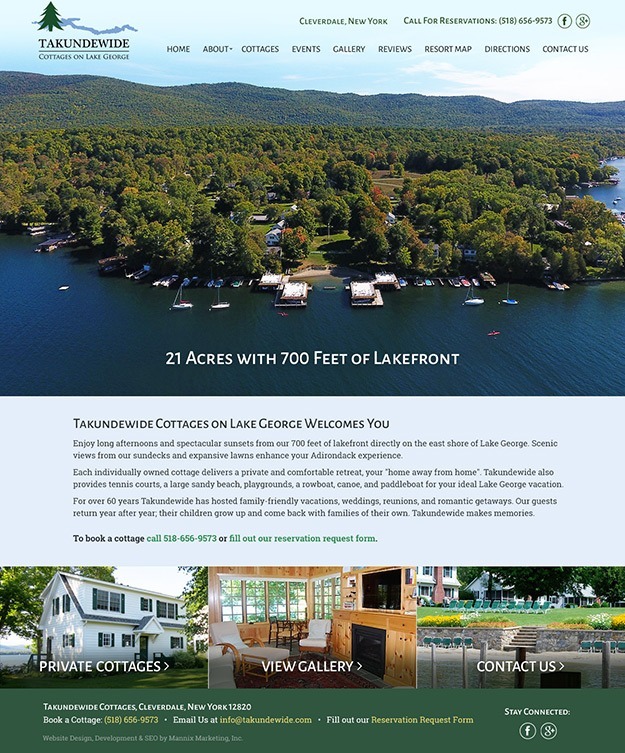 Takundewide Cottages on the east shore of Lake George features 21 acres of land in the Adirondack Park and 700 feet of lakefront property making it the perfect “home away from home.” For over 60 years Takundewide Cottages has been the Lake George destination for family vacations, weddings, reunions and romantic getaways. Calls-to-actions throughout the site encouraging visitors to check availability or request a reservation ultimately leading to a booking. The redesign gives each cabin its own slideshow gallery, a brief description, individual rates and a user-friendly availability calendar all on the same screen to help the customer find the perfect cabin at the right price. Pages per session and time on site lowered but that means they found what they wanted quicker!